At the start of this year I said that I would join in on only one knitalong this year, the Best Year Ever KAL being hosted by Nikki of the Tea and Possibilities podcast. 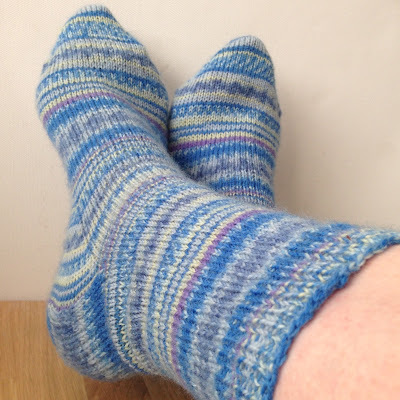 I know I haven't managed to stick to that, and joined in the Sockmatician Sockalong in March, but I did actually complete those socks, so I'm glad I did (and that yarn definitely needed knitting - the finished socks are lovely!). Now we're a quarter of the way into the KAL, so here's a little update. My list has had a complete reshuffle. Item one on my Best Year Ever KAL is now my Dotted Rays shawl. I am really enjoying working on this. The rows are now LONG - over 300 sts, though now I've memorised the pattern the stitch count isn't critical, so I have given up counting the number of stitches (I gave up when there was a discrepancy between my numbers and those in the pattern; I am certain I am correct, but don't wish to question Mr West's maths...). I am a little way into the third of five balls, and suspect that when I sit down and work on it I will whizz through it. 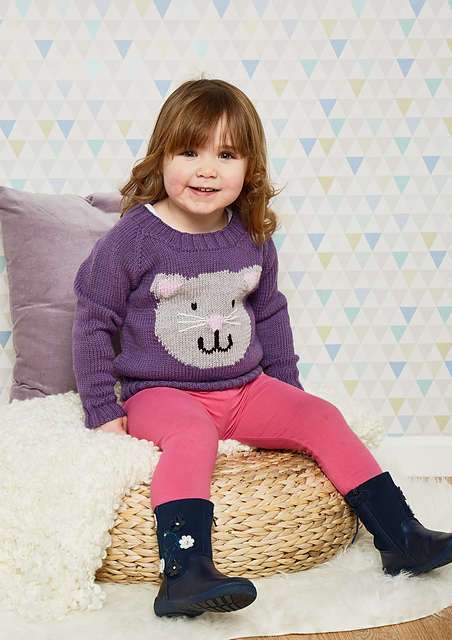 The Easter holidays are coming up, and the amount of mindless garter stitch makes this a pretty perfect soft play knit. The second item on my list is my pink socks. They do have a planned name for when I release the pattern, but if that falls through I might just go with 'Whhheee!!'. I struggled a bit with these socks at first; they're part of a collection of three patterns and the first two went really smoothly. This pair was meant to be the easiest, but that turned out not to be the case. To make matters worse I started these off as two at a time socks and it messed the gauge up, so I had to start again. But as soon as I had sorted out the pattern and fixed all the early glitches I started to really enjoy them; the spiral nature of the rib means it really does feel like you're going whhheee! as you're knitting them! And the pink is so wonderfully vibrant; these socks have made me very happy. I am undecided on my Antler jumper: I had been having gauge problems, so when I got to the end of the sleeve it wasn't long enough. I could just about have coped with that, expect that I am wondering whether the yarn might be too itchy for me to be able to wear it. I fished it out this morning to photograph and I am wondering whether it might be salvagable. If not, it's not the end of the world - I am considering casting on a new jumper for myself in the next few months, possibly a Pavement by Veera Valamaki, which looks like it might be a good transitional season jumper. *Ravelry link, you must be signed in to Ravelry for the link to work. My Instagram feed features an awful lot of knitting and yarn, and every now and again an adorable kitten or cat; it turns out cats are remarkably photogenic (and who wouldn't want to be a cat? I am a big fan of being able to curl up in the sun and while away the day). Inspired by this, a few months ago I decided to design a children's jumper featuring a cat's face: The Cat's Whiskers. The Cat's Whiskers. Image copyright Practical Publishing. This jumper would make an excellent first intarsia piece: the cat's face is mostly a single block of colour with the more complex colourwork coming much later in the chart, by which time you'll be pretty experienced in the colour changes! The project is also sufficiently small that it needn't be a daunting task. The sweater is knitted in Lana Gatto Super Soft, which is an excellent value DK weight 100% merino yarn that comes in lots of lovely colours. I hadn't come across this yarn before I used it for this design, but would definitely recommend it; if you can't get hold of the recommended yarn, the design would work in any wool or wool blend DK. If you fancy making a cheap and cheerful version I often use Paintbox Yarns DK* for children's knits as it wears really well and comes in 60 colours - you could even use colours to match your own cats! The Cat's Whiskers is knitted flat in pieces from the bottom up, and the neckline is knitted on in the round after the body and shoulders have been seamed. The cat's face is incorporated using the intarsia technique, and the mouth is embroidered in upside-down duplicate stitch so that the sewn stitches sit between the knitted stitches. The pattern is written in five sizes: 2 (4, 6, 8 and 10) years, to fit chest sizes 53 (58.5, 63.5, 67, 71) cm [21 (23, 25, 26.5, 28) inches]; the sample shown is in the age 4 size. The Cat's Whiskers is published in issue 72 of Knit Now magazine, which is available in all the usual places (newsagents and supermarkets) now. If you can't get hold of a copy locally, head over to the More Mags website to get a copy delivered to your door; alternatively you can order a digital copy of the magazine here and get started right away. *Affiliate link; see the Disclaimers and Policies page for more information. Good morning! Today it is Mother's Day in the UK, and I am up bright and early (the clocks changed last night, so while they say 7.30 it doesn't feel like it!) while my daughter pootles around the living room, enjoying the first proper full weekend of sunshine we've had this year. When I was small Mother's Day meant bunches of flowers given to the child at school and handed to their recipient a couple of days later, slightly wilted, and a handmade card. There was also usually a homemade cake, garishly decorated with as much food colouring and smarties (colourful chocolate 'beans' coated in a sugar shell) as we could get a way with. While I was at junior school (7-11) and also a Brownie, the church in whose hall Brownies was held always invited the Brownies and their mums to the service on the Sunday (Mothering Sunday is technically a religious date, falling the third weekend before Easter); this was often a poorly attended service, which meant the chances of being designated flag-bearer were pretty high (I was always very excited about being flag-bearer; at some point during the ceremony each Brownie and Guide unit at the service would parade their unit flag to the front and place it in the special holder where they would be displayed for the rest of the ceremony). And no, being a flag-bearer wasn't exactly a gift for the mother, but it's always nice to watch your children doing things they're excited about! These days I am a mum, and Mother's Day has become a rather more commercial event, with the shops being littered with balloons, chocolates and all manner of floral gifts, and anywhere that can hosting special afternoon teas. We're not doing anything special; I know that my children have each made me a card (the one from my daughter dropped out of her lunch bag yesterday when I was tidying up), and there is promise of my not having to cook this evening. It's nice to know that I am appreciated, but equally, I am lucky enough to know that I am appreciated as a mother every day of the year. P. S. If anyone is interested, I am doing ok at the monogamous knitting. I have one pink sock and my Dotted Rays is keeping me company when the pink sock is too tricky! The weekend before last I went on another yarny adventure (my second in three weeks having been to Joeli's retreat, which is pretty good going! ), this time to Edinburgh Yarn Festival. This was a real treat as I had thought that I wouldn't be able to go as my husband was going away that weekend, but his plans fell through and I got to go! I decided to post a photo an hour to Instagram for the day, so have lots of pictures to share here now. Here is my day at the Edinburgh Yarn Festival. My day started way too early - I managed to get up even before my alarm went off at 5.50am. As I was up so early, I had time to make and drink a coffee, and wound the next skein of yarn for my Dotted Rays, just in case I finished the skein I was on (which seemed pretty unlikely as I had about 25g of that skein to go, but it's always good to be prepared). I had planned to get the bus to the station, hence the very early alarm call, but in the end decided to drive and park so I wasn't left hanging around waiting for a bus in the evening. This meant plenty of time to get breakfast at the station, and a bit of knitting while I waited for my train to arrive. The train from Durham to Edinburgh takes a couple of hours (and is a very scenic route as it runs along the coats for large sections), which I spent in the company of knitwear designer Katya Frankel, which was lovely. I also browsed through my copy of The Simple Things magazine (I love this magazine and love to have a copy with my while I'm travelling; I am clearly their target audience - there was an advert for the knitting shop Loop in there!) and did a few more rows on my Dotted Rays. I arrived in Edinburgh and was greeted by my friends Lynda and Leigh (Leigh makes excellent knitting bags, you can check out her shop here) who I joined for (another) breakfast, before finally making our way to the show. When I arrived at the Festival I was on a bit of a mission; I wanted to get two skeins of red yarn to make a scarf, two Portuguese knitting pins and some buttons for a cardigan. I had been warned by many of the people that had gone to EYF on the Friday that it was incredibly busy, that the marketplace was rammed with people, and that if I wanted to buy particular things, I would be best off heading straight for the stall and buying straight away. Taking this advice I headed straight into the marketplace when I arrived and started my search. Saturday was (fortunately) a bit less busy. There were a lot of people, but not so many that it was overwhelming, and there were lots of spaces in which you could take a break and breathe for a few seconds. I saw a lot of beautiful red yarn: Phileas Yarns, Travel Knitter and Easy Knits all had yarns that I loved. Dye Ninja was my favourite though; there were so many beautiful, intense saturated colours on the stand. I loved all the shades of blues and greens too. Having a definite plan made browsing a lot easier; I saw a lot of things that were beautiful - everything The Wool Kitchen had for sale was so vibrant and cheerful - but having a plan meant I wasn't tempted to buy things I wasn't necessarily going to use (and I have plenty in my stash that may never be used, so don't need any more!). I could only find one stall selling buttons, but it was a good one! Textile Garden had loads of tiny glass pots with a huge variety of interesting buttons. Obviously I was drawn to the novelty section... I have no idea how I resisted the octopus buttons! One brilliant thing about Edinburgh Yarn Festival is the podcast lounge: a large seating area where you can sit and knit, chat and eat (including picnics; which allows more money for yarn!). I sat in the lounge for a few hours over the course of the day, catching up with people I know well, people I've met before, people I know of through Instagram and meeting new to me knitters. Everyone was very welcoming, and it was lovely knitwear-watching as so many people were wearing amazing knitwear! I left the Festival around 3pm, and enjoyed a walk through the city with friends, followed by afternoon tea and a bit more knitting. I deliberately tried to take it pretty easy as I know that overdoing it when I go away for the day tends to knock me for six. Finding a peaceful cafe was very welcome after all the hustle and bustle of the festival. I caught my train home a little after 7pm, and slept pretty solidly almost all the way home! And here are my very modest purchases: 200g red (Nanny Ogg's Bloomers, with a donation to the Alzheimer's Research UK, in memory of Terry Pratchett) merino/silk blend DK from Dye Ninja, two Portuguese knitting pins from Textile Garden and a mini skein from Easy Knits (which will be added to my sock yarn blanket). I didn't buy any buttons as I couldn't see what I wanted (cats), but have since bought some bird buttons from Textile Garden, and they are lovely. Did you go to Edinburgh Yarn Festival? What did you buy? Will you be going next year? This week I have mostly been... a bit poorly. Nothing major, 'just' a sore throat, but enough that I've been going to bed a couple of hours earlier than planned, and getting up as late as I can get away with. And as a result the days have been shorter and I feel like I haven't got a huge amount done. Not nothing though, here's what I have achieved! There has been sunshine! And while I did have work to do so couldn't go out and revel in it too much (it's still not warm, in spite of the sunshine), I did manage to find a sunny corner to do some work in one morning this week, which was lovely. I also treated myself to some new pens; my favourites are cheap Bic biros, and I was delighted to find a pack containing pink, purple, green and blue ones. No more notes in boring colours for me! My pink socks have been on and off the needles several times, but I think this time they are right. I'm now knitting them one at a time as knitting two at a time was affecting my gauge. The colour is wonderfully uplifting, but this is as much progress as I've made on these socks this week as I haven't finished writing the pattern, so some rounds require more brain power than my brain has seemed capable of this week. I really hope to finish the pair next week. I am on to the second book in the A Series of Unfortunate Events series, and while I'm enjoying them I am not getting through them as fast as I thought I might. This may be a rare occasion when I liked the film (TV series) better than the book. The TV series is more fleshed out, while the book is very much the bare bones. I will read them all, but might be on a bit of break as soon as I've finished the second. Swatcher's block. Cake cures everything, right? Thursday was when my throat was at its worst, so while I tried to do some work at home - swatching - it just wasn't working. I decided to call it a day and went for a walk instead. As is often the case, a bit of fresh air made a huge difference, and I sat in a coffee shop for a bit knitting a swatch that did what I wanted it to, while eating a delicious bakewell tart. I know hot cross buns are available all year, but I only ever buy them around Easter. They're one of my favourite breakfast foods, especially when toasted. I'm sure I'll be enjoying plenty more of these over the next few weeks. At home when I was little we used to make hot cross every Good Friday, and I think I might reinstate that tradition this year; nothing smells better than freshly baked bread. The weather this week has been a bit of a mish-mash, but my youngest was delighted when our walk to the shops on Saturday involved a fair portion of muddy puddles to splash in! These wellies have been a delight, and get many admirers while we're out and about; this weekend was their final outing as they're getting rather snug. We bought some new Paw Patrol ones, but they're just not as good. We had guests yesterday, so I picked up some cake while I was at the shops. Apparently I had lemons on my mind as there was definitely a theme! The lemon fondant fancies are my favourites and I always make sure I pick up at least one box while they're available. I am still baffled as to why Mr Kipling don't have three lemon ones in a regular box; the strawberry ones are just weird! Yesterday I decided to work solely on my Sockmatician Sockalong socks as I want to get them off the needles. I went from the toe to the heel yesterday; apparently working on one item at a time means you actually feel like you're achieving something. Maybe I should do that more often! 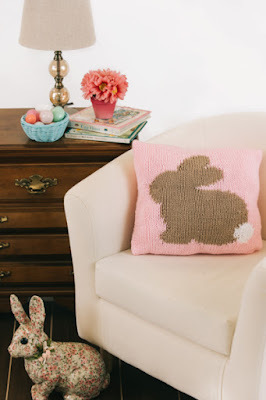 This week's new patterns are all about the bunnies! The April issue of I Like Knitting magazine has a section called Some Bunny Loves You, which includes several patterns featuring Bunny motifs, perfect for spring. First up we have my Peter Rabbit Pillow and Blanket set. The Peter Rabbit Pillow and Blanket feature the same motif: a rabbit silhouette with a fluffy tail. Both designs are knitted using the intarsia technique on a stocking stitch background, and would make a perfect nursery set. The designs are knitted in chunky weight yarn (Hayfield Baby Chunky and Sirdar Snowflake Chunky) so are quick to knit. 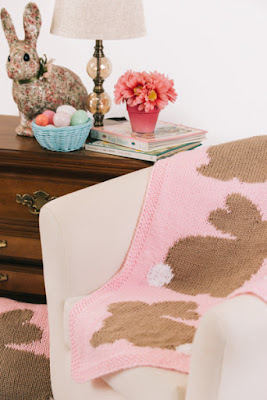 The set is shown with a pink background, but could be knitted in any colour - I think the bunnies would be perfect on a purple or green background. And secondly we have my Baby Bunnies Cardigan. 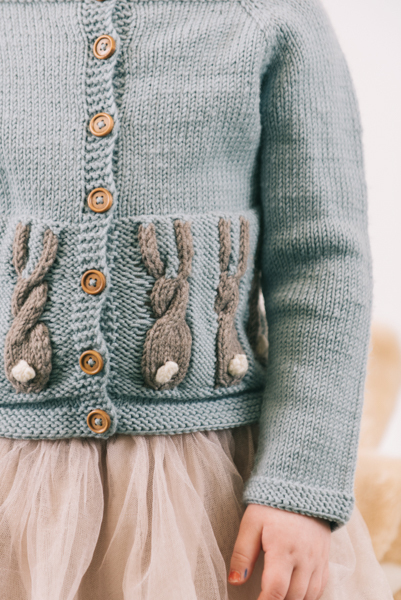 The Baby Bunnies Cardigan features a border of cabled bunnies knitted in stranded colourwork on a background of reverse stocking stitch. The cardigan is knitted in stocking stitch from the top down with a garter stitch border, raglan shoulders and buttons down the front. The pattern is written in sizes 2-10 years, to fit bust sizes 21–28 inches (52.5–70 cm). The cardigan is knitted in Drops Merino Extra Fine, a DK weight 100% Merino yarn that comes in a huge array of colours and is excellent value. All the patterns are available in the April 2017 edition of I Like Knitting Magazine, an e-zine that can be accessed either online or via the I Like Knitting website. Subscriptions are available from $19.97. All images in this post copyright I Like Knitting magazine. In late February I went on my first ever yarn retreat (I am certain it won't be the last). I've already told you about the retreat in general and the first class I attended (Lace Knitting with Katie Westermann), and today I'm going to tell you about the second class I attended: Portuguese Knitting with Julia Billings. Portuguese knitting was a mystery to me when I signed up for the class several months ago, and was still a mystery to me when I sat down in Julia's class. I was aware that knitting techniques varied around the world, having heard of English vs. Continental Knitting, but it wasn't something I'd put too much thought into. Julia's class stared with an introduction to the technique: Portuguese knitting is practiced in Portugal and South America, and the yarn is tensioned by one of two methods, either by allowing the yarn to flow round the back of the neck, or by running the yarn across a Portuguese knitting pin, which is a little hook that you pin on to your clothing. The knitting itself requires very little movement of the hands (stitches are worked with just a flick of the left thumb), and allows the purl stitch to be worked very efficiently, so people who knit using the Portuguese technique will often purl every row to work garter stitch or knit stocking stitch in the round by purling every round. Julia showed us how to hold the yarn and how to work the stitches, and after a little confusion and a few dropped stitches everyone in the class was able to work knit stitches. Some people in the class went straight for knitting with the pin for tensioning, but I wasn't wearing clothes that would happily have had pins put through them and went for tensioning the yarn round the back of my neck. The movements used in the knitting really were efficient, and even more so when we all moved on to purling! Julia said that the technique is good for people with limited mobility in their hands, and because the hands don't move much at all I think I might be able to use this technique for using small-circumference circulars, which have previously been my nemesis; once I've got some other things off the needles I'm going to have a go at knitting a pair of socks using Portuguese knitting and mini-circulars (though maybe not on the bus as the yarn round the back of the neck will get some odd looks!). Once we had all mastered the basic stitches, Julia showed us how to work lace - I really struggled with yarn overs as I was over-thinking how to work them and ending up with double yarn overs instead. I did eventually get it, and with practise might be ok. We were also shown how to knit stranded colourwork using the technique and this is another area where I think the technique will come in handy. At the minute I pick up and put down to work stranded colourwork, which is really inefficient, but with Portuguese knitting you can wrap one colour behind your neck in one direction and the other colour in the other direction, then just work each stitch in the correct colour. I will try this with Portuguese pins though as having them both round my neck I was forgetting to release more yarn for each stitch and the work kept getting closer and closer to my face! While I didn't know what I was expecting at the start of the class, I really enjoyed learning a new technique. I hope you've enjoyed the posts about my yarn retreat adventure. I really did have a fabulous time and hope to do it all again some time. Have you ever been on a yarn retreat or taken a particularly enjoyable knitting class? What do you recommend I try next? In the autumn a close friend announced that she was expecting her second baby. I had knitted a hat and blanket for her first child, but every new baby requires a special present, so I decided that I would knit a blanket for this new baby too. The design is one that has been in my head for a long time, and may be familiar to anyone who has been following my work for a while: a zooming rocket with a fiery tail! The rocket motif first appeared on my Reach for the Stars baby jumper, which appeared in an issue of Knit Now a few years ago, and I had always had a blanket in mind for the same motif. The Reach for the Stars baby blanket is knitted in a single piece with a large moss stitch border surrounding the central stocking stitch panel; the moss stitch border makes the blanket lie flat, and means that blanket requires minimal finishing. The rocket motif is knitted into the blanket using the intarsia technique. The chart for the rocket motif is split vertically across two pages to maximise the size of the individual squares, while you only have to work from one chart at a time. Chunky weight yarn is used in this design, allowing it to be knitted up quickly. The sample is knitted in Paintbox Yarns Simply Chunky, an acrylic yarn that comes in a huge array of colours, so you can mix and match as you please. This yarn also has the advantage of being machine washable, so is perfect for new parents. The pattern is available now from my Ravelry store at the introductory price of £3 until 11.59pm GMT Tuesday 14th March 2017, after which the price will increase to £4. The Reach for the Stars baby blanket will be joined by other designs featuring the same rocket motif over the course of 2017, including a cushion, baby/toddler jumper and children's jumper. If you know now that you would like to have access to all the patterns, you can buy the ebook for the introductory price of £7.50; the additional patterns will be added automatically as I release them. The ebook will increase in price to £10 as soon as the second pattern is released.